Our fiberglass replacement handles provide more strength and durability over wooden handles. 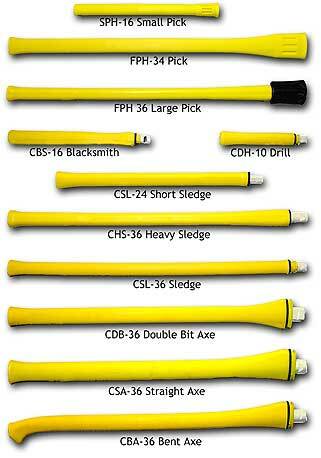 We weld up to 175 rovings of fiberglass per handle into a smooth, strong handle. The waterproof, non-warping and non-corrosive features of fiberglass assure customer satisfaction. We produce handles for sledge-splitting mauls, single bit axes, and pick/mattock applications.